Homecoming week has arrived on the east side of Presque Isle County with Rogers City and Posen high schools in the middle of spirit week festivities. Both schools have their dances Saturday evening with Rogers City keeping the name of their king (Mr. Football) and queen under wraps until halftime of the football game. Posen already has named seniors Brady Chojnacki and Noelle Strzelecki to lead the fall royalty. Rogers City students have been building floats this week in anticipation of Friday’s 6 p.m. parade from the Grambau Education Center to Gilpin Memorial Field. Float winners will be announced at halftime with the theme of board games. Before the game, the Huron Sports Boosters are again sponsoring bubble ball at Gilpin Field from 4:30 to 6 p.m. Booster president Rachel Romel Galer said volunteers are needed and welcome to come help out. The end zones are scheduled to be painted orange (weather permitting). Halftime will be extra festive this year, as the 1982 Silverdome football team has been invited back to commemorate the historic run to the state championship game 35 years ago. 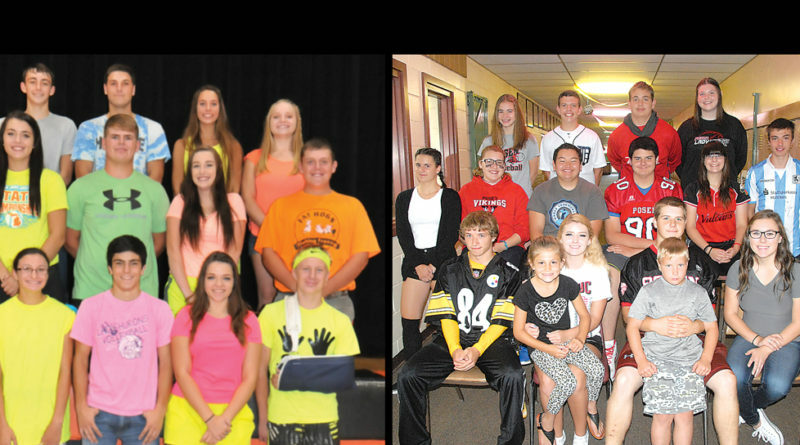 Monday was neon day at Rogers City High School, while Tuesday was Disney day. Wednesday, the students donned college attire. Today is holiday day and tomorrow is the traditional wearing of the school colors, not only at school, but throughout town as well. The pep rally is 1:45 p.m. with the express football game between a team of sophomore/senior girls vs. the junior/freshmen girls. The football game is against winless Mio. Posen’s spirit week started with athletes vs. mathletes, followed by dress-up day on Tuesday. Wednesday was the decades theme (middle school/1990s; ninth-grade/1980s; 11th-grade/1960s; and 12-grade/1950s). Today is twin day/opposite day and Friday is red-and-white day. There also will be a boys’ volleyball game at 1:15 p.m. and the pep rally at 2 p.m. The football game is against cross county rival Onaway. The crowning Saturday night will be at 8 p.m.
Onaway still has three more weeks before its homecoming game Oct. 20 with the dance to follow the next night.